Using the MMa Textbook font (shipped with Microsoft 2010), this intriguing résumé reminds us a little of a ransom note but with plenty of styling to keep it smart and professional. That's why this résumé has earned its name - but there are loads more features that make it a great choice. The handdrawn border gives it a slightly informal feel, while the photo placeholder allows you to include a picture if you want to. The sections are divided up with lines to ensure that your key skills and strengths are easy to find, and the use of caps for the job titles and qualification names really helps your prospective hone in on what's relevant. All in all, this black and white résumé template makes a striking impression and is perfect for a multitude of job roles. 'Pieced together' CV/résumé template	Overall rating:	5	out of 5 based on 4	reviews. 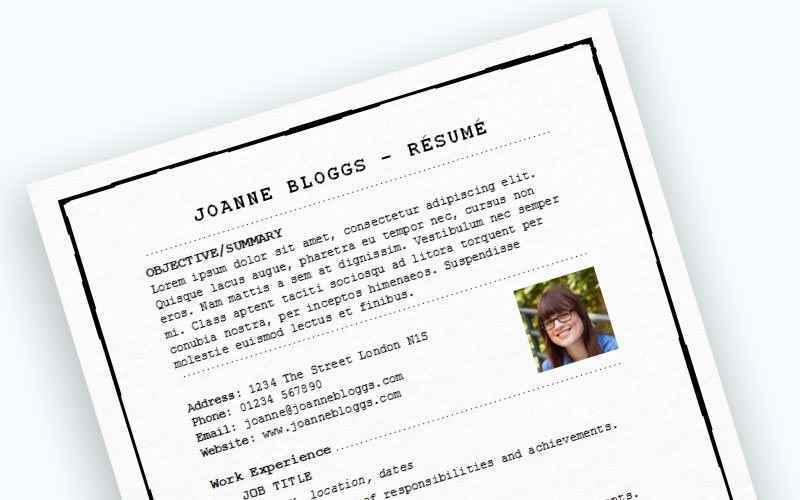 Using an attractive and very noticeable Microsoft Font, this quirky résumé template has a hint of 'ransom note' about it. The neat headings and dividers keep the design on track and the picture is easy to replace with your own, or remove if you prefer. Most job seekers create a CV for their very first position and then simply keep updating the work history as the years roll on. Unfortunately this will leave you with a tired old CV that just won’t make any impact in today’s competitive job market. Go back over your list of previous roles and see how many of them are relevant to the new role you are applying for. A generic list of past jobs along with their tasks and responsibilities is not going to impress the hiring manager, but what will stand out is how you focus and highlight the relevant roles. It doesn’t mean to say you should leave any past roles out of your CV as a gap would always look suspicious, and instead you should not worry too much about listing the tasks and responsibilities if they don’t relate to the new job. If you are applying for a sales role then you want to detail your sales experience. If it’s a customer service based role then look for past jobs that interacted with customers on a daily basis, and include scenarios, stats and results to show how well you performed. For more information on how to write the ‘work experience’ section, please click here. If you are unsure of what a cover letter is and/or you would like help writing one, please click here for some great examples. The importance of a cover letter can be very underestimated. Ultimately you always want to plan to stay ahead of the competition, bearing in mind you could be up against a hundred other CV’s! If there are twenty other applicants with the same skills and qualifications as you and they have attached a covering letter but you haven’t – who’s application is more likely to gain an interview? Sometimes a CV alone won’t adequately represent what you can offer a company, and this is where the cover letter shines. It adds a nice touch and shows how much you care about the position, and allows you to explain in more detail what you are hoping to achieve. love this quirky template, i’ve used it minus the photo as I’m not sure it will help my application!! thank you for the template.